LOS ANGELES, CA -- (MARKET WIRE) -- April 20, 2007 -- In Los Angeles, the adage, "It's not what you know, it's who you know" still rings true. And the more people you know the better. L.A.'s Largest Mixer provides the perfect opportunity to mix business with the pleasure of networking to help build that ever-important contact list. "Networking is the core of my business. It equals referrals, which equals clients," said Leonard Gilbert, Owner, Westside Recovery Services, LLC, which specializes in medical and commercial collections. 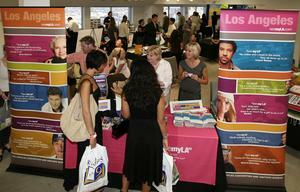 "L.A.'s Largest Mixer is the premier event to network. Over the years, I've picked up a number of important clients. My question each year is 'how can't I be involved in the L.A. Mixer this year?'" Scheduled for Thursday, July 26, 2007, the event will take place at the historic Shrine Auditorium Expo Center, 700 W. 32nd St., Los Angeles, CA 90007. A $20 admission fee gives attendees the opportunity to view more than 250 exhibitors and network with local "influentials" on the cutting edge of Los Angeles' business elite. "Networking is the only way to get your name out on a personal basis," commented Nancy Hoffman Vanyek, CEO of the Greater San Fernando Valley Chamber of Commerce. "L.A.'s Largest Mixer is one of the best ways to meet people serious about doing business from all over the Southland." Now in its 9th successful year, the Mixer has grown to represent a powerful meeting of Los Angeles area chambers of commerce and local businesses representing hundreds of industries and companies in Southern California. "Largest Mixer events are powerful portals where businesses and the community come together," said Mariah Bieber, Community Relations Manager, Jobing.com. "Jobing.com is dedicated to the local community. We want employers and jobseekers to know we are a resource right here in their neighborhood! At Largest Mixer events, we meet thousands of the local people we serve!" According to event creator Dave Linden, L.A.'s Largest Mixer was born from a similar event that he coordinated for the Palm Springs Art Museum in 1997 that drew more than 1200 business people. "Once I relocated to Los Angeles, I orchestrated a gathering of the local chambers and discussed the true potential of the event," said Linden. "If we were able to draw more than 1000 people in the Palm Springs area, I was certain a similar event in LA would produce great success for the local business climate." Designed to be part expo and part business social event, L.A.'s Largest Mixer accomplishes both by providing an "open feel" for the exhibitor's area and conversational areas for casual one-on-one discussions with existing contacts or building new relationships. "Networking tells the world that you are there!" said Steven Rose President/CEO, Culver City Chamber of Commerce. "You can sell yourself, which is the beginning of a great relationship, it works at the Culver City Chamber and at L.A.'s Largest Mixer." L.A.'s Largest Mixer is an annual event that brings together local business organizations and Los Angeles area Chambers of Commerce for an evening of professional networking and business outreach. A resounding success for the past nine years, the much-heralded event's format has even been reproduced in other regions, including Orange County, Inland Empire and Las Vegas. For a complete list of exhibitors and sponsors, please visit http://www.lamixer.com or call 323-860-9999 for further information. L.A.'s Largest Mixer IX is hosted by the following organizations: Chambers of Commerce: Century City, Culver City, East Los Angeles, Encino, Greater El Sereno, Greater Lakewood, Greater San Fernando Valley, Greater West Los Angeles, Hollywood, Los Angeles Area, LA Junior, Miracle Mile, Regional Black, Santa Monica, Sherman Oaks, Swedish-American, United Chambers of the San Fernando Valley, Universal City North Hollywood, and West Hollywood. Convention and Visitors Bureaus: Anaheim/Orange County Visitor & Convention Bureau, LA INC., and Long Beach Area. Business Organizations: American Business Women's Association, Asian Business Association, Downtown LA Business Improvement District, HSMAI-Greater Los Angeles Chapter, Latin Business Association, National Association Of Women Business Owners-Los Angeles, and Rotary Club of Los Angeles. The event is co-sponsored by Conexion, KABC Radio, L.A. Downtown News, La Opinion Newspaper, Market Wire, Meetings and Mixers, Reading by 9, ReEvolve Designs and San Fernando Valley Business Journal.